Laser hair removal has been around for over twenty years now. It’s contributed to countless razor-free vacations, eased endless bouts with burning at the gym and almost completely eradicated crabs (you’re welcome). 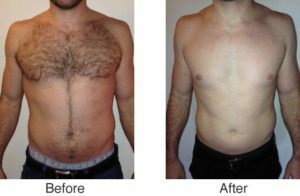 However despite its immense popularity with women, we’re always surprised how often we’re asked the question “Do men get laser hair removal too?” The short answer is yes. 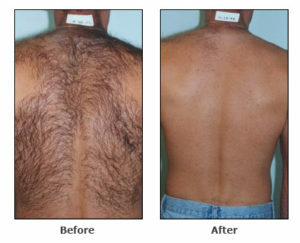 Plenty of men come to us to rid themselves of unwanted hair from all kinds of areas. In fact in many cases, laser hair removal can be even more beneficial for guys than girls. Hair tends to grow “progressively” as one ages. It is our hormones and our genetic makeup that dictate the patterns of hair growth in most of us. Testosterone is the most potent of the male hormones. Testosterone stimulates hair growth on the face and body. Generally, the more testosterone, the faster and coarser body and facial and body hair will grow. Men who use body-building steroids should not be surprised to see their hair, especially back hair, increase. Men can develop coarse nose and ear hairs, eyebrows become bushier, and the greatest injustice of all, the hairline recedes. All of these areas can be dealt with Laser. The most commonly treated area is the back. The Wembley MediSpa is proud to present Soprano ICE Platinum, a limited edition platform for 2016 featuring trio clustered diode technology. The platinum edition combines 3 laser wavelengths into a single innovative hand piece, simultaneously targeting different tissue depths as well as anatomical structures within the hair follicle. By combining the absorption and penetration levels of three different wavelengths, along with the treatment coverage, comfort and low maintenance of the diode laser, Soprano ICE Platinum achieves the safest and most comprehensive hair removal treatment available today. With CASE STUDIES AND SCIENTIFIC RESEARCH CONDUCTED BY SOME OF THE BEST PHYSICIANS AND RESEARCHERS AROUND THE WORLD, the Soprano Ice Platinum is the leading hair removal machine in the world – the Wembley MediSpa is the first MediSpa in Cape Town and the third MediSpa in South Africa to own one of these ground breaking machines, thus effectively contributing to our “Results Driven, Clinically Proven” motto with the world’s best technology. SHR is Alma Laser’s proprietary hair removal method used in clinics around the world. It is the only clinically proven method of laser hair removal that is virtually painless. 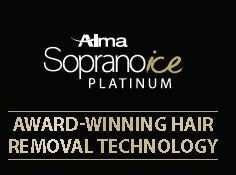 The Soprano ICE Platinum incorporates Alma’s SHR method, ensuring safe and comfortable hair removal. 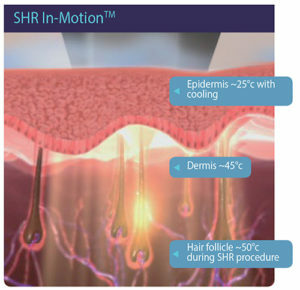 Rather than exposing hair follicles to a single high energy pulse which can cause trauma to the skin, SHR works by gradually heating the dermis to a temperature that effectively damages the hair follicles and prevents re-growth, while avoiding injury to the surrounding tissue. A high repetition rate of short pulses are delivered deep into the dermis, achieving high average power and therapeutically effective heat build-up. The sweeping In-motionTM technique of moving the applicator repeatedly over the treatment area ensures full coverage while ICETM tech cools the skin surface- preventing superficial burns and allowing for virtually painless yet highly effective hair removal.